Headed off first thing in the morning to the San Lorenzo Market. Blocks and blocks of open air booths filled with leather goods, silk scarves, ties, pashminas, backed up upon the retail stores which have even more stock on hand, should nothing be found which suits your size, style and price range. Ranging from the sublime to the merely whimsical. I asked one booth guy question about what type of leather a particular jacket contained, and was led to "his" store, where a salesman spent nearly a half hour showing me some exquisite antelope leather jackets (they have buffalo and lamb, too), and was quite put out when I didn't buy one, even though the price he finally negotiated with me (I was really saying "no", since I don't need another leather jacket, while he thought it was a haggling tactic) was pretty attractive. At one corner of the leather market is the indoor meat, produce, cheese, wine, and confection market, where my true buying weakness lies. I did pick up some truffle paste, cheese and one of the endless varieties of salami on sale. The provolone cheese we get in the States is a weak-kneed sister to the fantastically flavorful varieties here. I tried something new, fried pasta. They form pici (like fat spaghetti), ham and cheese into a cube, bread the outside and deep fry it. Can't wait to see that at the county fair; beats the heck outta corn dogs. From there we wandered back to the apartment for a salad and bit of antipasta, then headed to the Medici Chapel - not so much a chapel as an entire church dedicated to housing the remains of the whole former ruling family of Renaissance Florence. One of the women of the family started a huge collection of saints' relics and reliquaries, and many of them are on display on the main floor. I believe these relics are thought to have healing powers and convey blessings to those who possess them, and the Medicis were certainly a fortunate family; unimaginable wealth. The main basilica is under restoration, and has been for a number of years, but the ceiling there is nearly as marvelous as the Sistine Chapel, and far less crowded, filled with biblical scenes from The Fall to the Crucifixion. 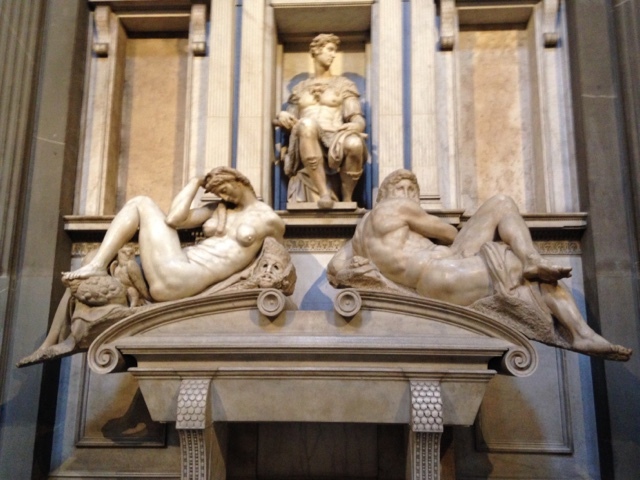 There is also a side chapel containing three of Michelangelo's statues; Mary and Child, Dawn and Dusk, Day and Night. A good place to contemplate mortality and immortality. We thought the heat of the afternoon might be a good time to check out the Boboli Gardens, so we trouped to the Altrarno's Pitti Palace and checked the ticket booth for times and prices to enter. Decided we wouldn't get the full experience of the gardens and museums in the time before closing, so we decided to walk a short ways away to the Torrigiani Gardens, a smaller nearby spot of greenery on the map. Oops. After walking the entire circumference of Torrigani, we determined that these were private, available only to the residents of the swanky homes at their south end. We could see over the walls that there was a really cool-looking old palace and tower inside (like the set of a King Arthur movie), so it was a pity we didn't get to see them. 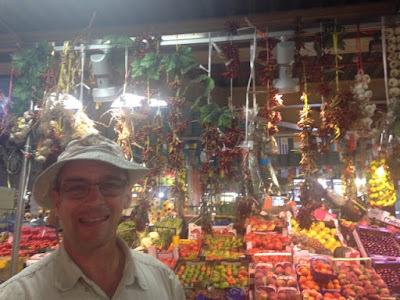 Along the trek, I visited a couple of hardware stores - there's a foot pedal sink faucet I've seen several times in Italy I really want to locate; it would be just the thing in the kitchen, when you have your hands full and want to turn on the water to wash something. The ferramenti were very much like old time hardware stores in the States, but very limited in space and selection - not exactly Home Depot, yet still very familiar. No sign of faucets. I may have to find a plumbing store. Another fun discovery was a 99 Cent store. Cheapest soda and juices to buy anywhere in the city. Defeated but not daunted, we returned to the apartment for a glass of wine, then ventured out to a restaurant we'd noted earlier. The Ristorante Lorenzo de'Medici serves a pici pasta dish with a wild boar sauce - I had to try it. We started with Insalata Pomodora (tomato salad) and Spinaci (sauteed spinach) and shared aplate of Empepata de Cozze (peppered mussels) and Pici Chiante Cinghale (pasta with wild boar) - all was delicious. People-watching on Santa Maria Nuvella square and Ponte alla Carraia bridge, then off home to bed.